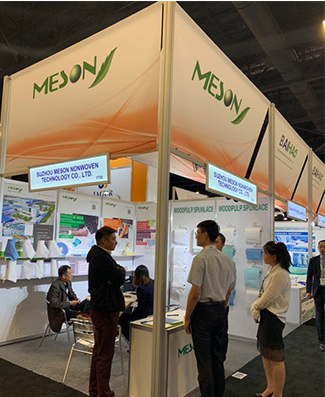 Professional wood pulp spunlace non-woven fabric supplier - Suzhou Meson Non-woven Technology Co., Ltd. participated in the 2019 IDEA exhibition - Suzhou Meson Nonwoven technology Co., Ltd. The IDEA2019, organized by the North American Nonwovens Association INDA, was held at the Miami Beach Convention Center in Florida from March 25th to 28th. The event attracted more than 7,000 professional visitors and more than 500 non-woven supply chains from around the world. Business. They showcase unique innovations, materials and social security that give nonwovens producers the opportunity to access the latest technology and market information in one location and align corporate strategies with global trends to sustain healthy, stable growth. Suzhou Meson Non-woven Technology Co., Ltd. was led by General Manager Yuan, and the sales director Mr. Chen and others participated in the exhibition. Taking advantage of this exhibition opportunity, our exhibitors have established a professional, dedicated and trustworthy corporate brand image for new and old customers, and promoted the research and development of innovative wood pulp spunlace non-woven products, and supplied with domestic non-manufactured non-woven equipment. The business plan to develop a new project for the future of Meson. If you want to know more about our products, you can visit our website: www.mesoncn.com or call the 24-hour free customer service hotline: 0512-52588865.